Interestingly enough, many super-advertisers skip this years super-bowl. P&G, Unilever, Microsoft all won’t show a single ad during the game. We think we have a product and a message that stands alone. Borrowed interest is always something you look at, but [our marketing] will give us more pop, in our opinion, than going into a Super Bowl environment. Seems like the main advertising sports event had reached its peak last year and is now on the decline. At least as long as they don’t change something about the setup – i.e. prices, integration with other media/events/channels, whatever. Does that mean advertisers will shift more to online? Not necessarily so. Dove experienced good results with outdoor last year and expects more resonation of the academy awards. Then, when I noticed I would indeed continue with blogging, I moved everything to my own domain with a much more flexible blogging software. So I moved to web-jungle.com and wordpress. Now this again is even more than a year old. I have blogged with wordpress since September 2005. Since then I have abandoned the blogspot location. Interesting, that my content is still there – talking about digital trash! Looking around, I notice that some blogs are already a few years old (but still only up to 6-7 years at the most!! ), and I wonder, if blogs will, from now on, continue to be part of some peoples lives? Will I still blog in 5, 10 or 20 years time? How big would my archive of information be? What wealth of information and links would it provide? What wealth of information and links would generally exist in 30 years, if bloggers and content-/link-platforms continue they way they manage content these days? All these are faszinating thoughts, theoretical in nature, as we’re all going to experience the effects of the web at the same time, with lot’s of people putting out theories, with only a few really succeeding in implementing good platforms and everybody learning and adapting as they go along. I already enjoy the ride, how about yourself? „We are planning to establish a Swedish embassy in Second Life primarily as an information portal for Sweden,“ Swedish Institute (SI) director Olle WÃ¤stberg told AFP. They won’t issue visa, instead they will tell people how the obtain visa for Sweden in the real world. And they want to inform people of how nice and beautiful Sweden is… This sounds more like a regular tourist information to me, than an embassy. But nevermind – I like Sweden and I hope this helps. Many of man’s greatest works demand and deserve extended, steady attention. They can’t be boiled down. They can’t be snippetized, widgetized, or otherwise turned into bite-sized morsels. You can’t compress culture into a Zip file.And that’s the danger here. The new medium doesn’t just promote the proliferation of small pieces; it devalues the long form. In fact, it doesn’t even make room for big, extended works. It’s actively biased against them, technologically and economically. Scary, if we loose the ability to focus on longform content in the future! But at the same time I think you need to differentiate between types of content. I don’t need the news in longform content, as long as the main facts are delivered. Many articles I read in newspapers in the past focused too much on storytelling for news where I was only interested in the main facts. But: sometimes storytelling is important. Either because there are news that I want to have some background information on (and while newspapers and magazines are generally prognosed to face a difficult future, I still think this deliverance of background information is a good niche for them, when trying to compete with online media). Or, because we are really interested in the story, the athmosphere and the characters, much more than pure facts and the plot (i.e. facts). I don’t think, for example, that it would delight many people, to read the last Harry Potter through a number of interlinked microchunks on the internet. We want that book, and we will take our time to read it, the more pages, the better! Some might have seen it already: I had some database problems over the last couple of hours. This was due to the fact that during some maintenance work the databases got lost (don’t ask!). So that’s why the last post before this is was from xmas. Ok, there goes the weekend. 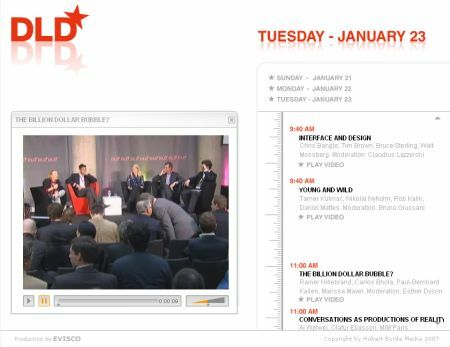 Guess Iâ€™ll be pretty busy – I just found out that you can watch all the videos of the â€œDigital Life Designâ€ Day on the DLD 07 Media Website. See Marissa Mayer of Google speak about the billion dollar bubble or John Naisbitt about â€œMind Set!â€, probably based on his new book. Or Luc Besson, Craig Newmark, David Sifry, Arianna Huffington. See? Guess youâ€™ll be busy, too. Love it! 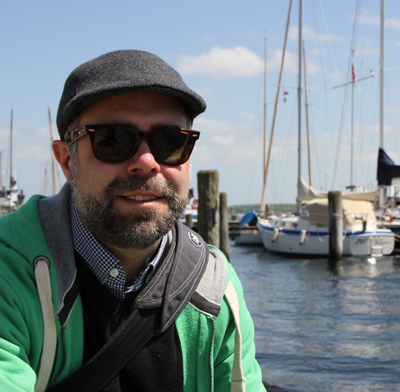 Werbeblogger just pointed me to a cool siteGet a first life (go outside, membership is free). 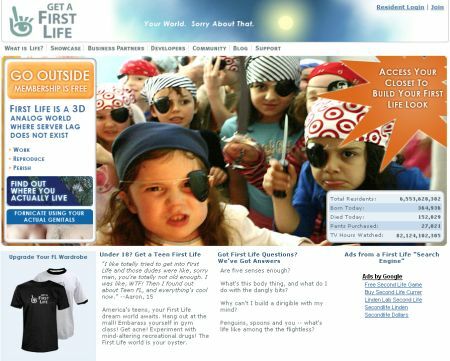 And of course it lists total residents (6+ billion), you can get first life clothing for real dollars (at cafepress.com), in a 3D analog world, where server lag does not exist. Hhm, maybe I should try that sometime.